There we were last Wednesday night in a brand new fantasy world. This world was one in which Hammersmith and Fulham’s Conservative-run Council complained about a property speculator’s building proposals because of “inappropriate height and massing”, their “failure to provide a suitable affordable housing provision”, “excessive density”, lack of “residential amenity”, its “un-neighbourliness” and even how it “would harm the character and appearance of the conservation area.” Consequently, the 3rd August 2011 Planning Applications Committee (PAC) refused A2Dominion’s application to build 91 residential units at Queens Wharf, Hammersmith. Initially there was surprise amongst the seasoned observers that had turned up to witness this unusual event. Now, the Conservative Administration was making arguments it had previously scorned when made by residents and Opposition councillors on countless other schemes. So what happened? Was this some sort of Road to Damascus style epiphany? Had they seen the light? Well let’s consider what we know: Up until the summer of 2009, Westcity Plc owned Queens Wharf. They had bought it for over £30 million. H&F Council owns the freehold to the neighbouring Riverside Studios. On Thursday 13th March 2008, senior representatives of H&F Council met with Ira Rapp, Chief Executive of Westcity Plc, in Cannes on the French Riviera. The Council refused to provide minutes of that meeting but they did concede that they were discussing plans to construct a new building on the Queens Wharf and Riverside Studios sites - which they had been doing for some time. It later emerged that the Conservative Administration had also secretly offered up the “opportunity” to include hundreds of people’s homes on the Queen Caroline Estate as part of a much bigger riverside demolition and development. The Leader of the Council was forced to reluctantly admit that in this video filmed on 29th April 2009. Residents were deeply worried but the worldwide economic slow down intervened and it became difficult for property speculators to raise funds. I eventually met A2Dominion for a briefing meeting on 1st December 2009. Initially they had wanted to bring along their partner representatives from the Board of the Riverside Studios but I declined. They confirmed they were still working closely with H&F Council. They told me they hoped to have plans in front of PAC for a joint Riverside Studios/Queens Wharf scheme sometime after May 2010 – shortly after the local elections were out of the way (and when the Conservatives expected my fellow Hammersmith Broadway councillors and I to have lost our seats and be less able to oppose any undesirable schemes). I next met A2Dominion eleven months later on 3rd November 2010. The expected plans had not been submitted to PAC and it was apparent the relationship between them and the Administration had soured. The joint Riverside Studios/Queens Wharf development was, for the moment, no more. Now, A2Dominion were focussing solely on the site they owned. At that meeting, A2Dominion told me that they had met a senior person from the Berkeley Group in the summer of 2010. He had told them that a senior H&F Conservative councillor now wanted the developer of the brownfield Hammersmith Embankment site to also develop the Riverside Studios and Queens Wharf sites. How he knew that is unclear but it was interesting that the St George division of the Berkeley Group later purchased the Hammersmith Embankment site in October 2010. I asked A2Dominion if they would sell the Queens Wharf site. (Having bought it for such a low price they might feel that was the easy option.) They gave an unequivocal “No” and said they were determined to build Queens Wharf for themselves. I met A2Dominion for two more briefings on the 27th January and 24th May 2011; their relationship with H&F Council hadn’t improved. So last week at the bizarre PAC meeting, I enquired how this broken relationship had affected the Council’s approach to A2Dominion’s plans. A visibly furious planning officer refused to answer the question, saying it was irrelevant as the committee could only consider the current plans before it. It was useful, however, to be shown pictures of the whole riverfront and for another planning officer to go on-record and say that Queens Wharf was the Borough’s “most sensitive site.” Presumably then, the neighbouring riverside sites are also sensitive? Now, consider what’s happening a hundred metres or so down the road on Hammersmith Embankment. St George has submitted plans for a truly massive development of 744 residential flats which will be built up to 9 stories high. They have re-christened the site “Fulham Reach.” Included in their proposals are plans to build accommodation they describe as "Manhattan Apartments." These tiny dwellings are more reminiscent of Tokyo micro-flats than anything I've ever seen in New York - I cannot see how they will add anything to our area. The PAC will discuss and vote on those plans at its next meeting on Wednesday, 14 September. All indications are that H&F’s Conservative-run Council actually intends to grant permission for this scheme. Planning pictures attached to HAMRA's objection letter. There’s a more thorough critique of St. George's proposed scheme in the excellent objection letter from Melanie Whitlock, the Chair of the Hammersmith Society. To view it you need to go to the “Consultations” section of their website and click on the Hammersmith Embankment link. Planning officers are currently writing up their recommendations about the Hammersmith Embankment application. Residents wishing to try and influence the planning process should send their comments and objections in by either clicking here or email letters directly to the planning officer here and quote reference 2011/00407/COMB. I advise that those should be sent in by Friday, 2nd September as the planning papers will be published here on Monday, 5th September but it is still possible to hand comments and objections in right up to the moment the PAC sits at 7.00pm on 14 September. 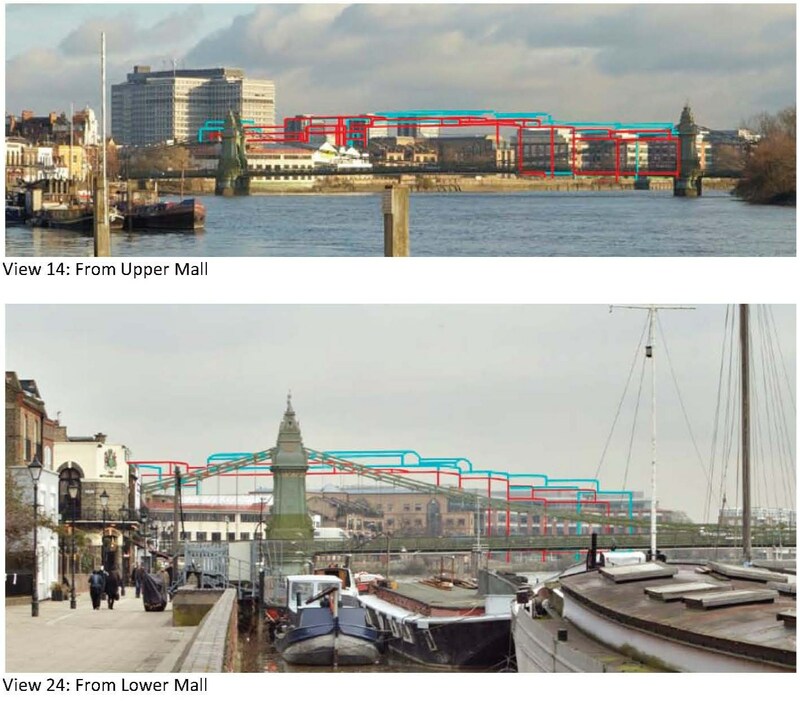 Hammersmith and Fulham's Conservative Administration intends to develop large tracts of the Hammersmith's riverfront. If you get the chance, take a moment to stand on the Barnes side of the river bank next to Hammersmith Bridge. Then consider that over the next few years they hope to start demolishing and building new schemes stretching from the left of your view point at the Town Hall, to the Queen Caroline Estate, Queens Wharf, the Riverside Studios and Hammersmith Embankment (Fulham Reach) on the right of your view. That’s an awful lot of building works and we haven't even considered their plans for Fulham or Shepherds Bush. Currently, all of their schemes share one common characteristic: they're all against the wishes of every residents’ association, every amenity group and the majority of local people in the affected area. That cannot be a good way for an elected local council to behave. 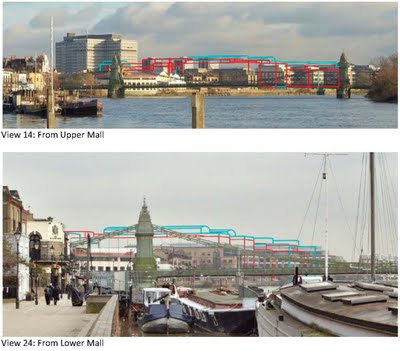 If you’re concerned about the Hammersmith Embankment scheme and want to let H&F Council’s decision makers see the strength of public concern please come to the next PAC meeting which will be held at Hammersmith Town Hall at 7.00pm on Wednesday, 14th September. I’ll see you there.